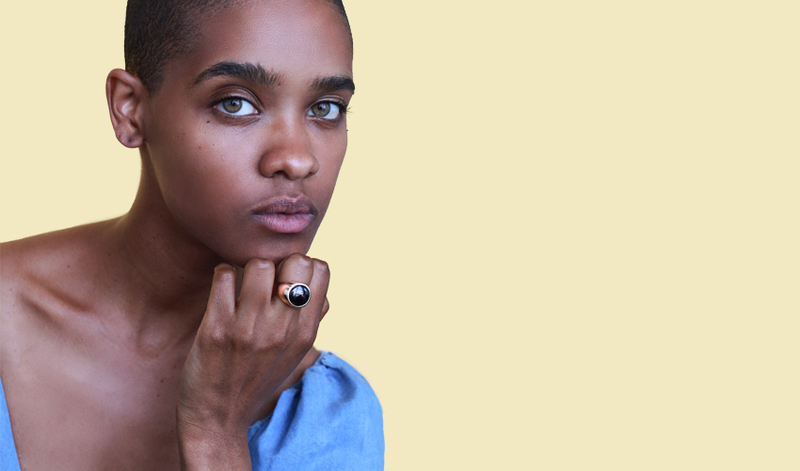 An onyx ring is a versatile and elegant piece of jewelry that comes with a lot of benefits. It goes great with both formal and casual outfits, it has an irresistible brilliance and it adds a creative touch to your look. If you want to learn more about this fascinating gemstone and why you should get an onyx ring, read further. We have prepared an interesting article for you in which you will find out everything you need to know about this beautiful gemstone. What is an onyx gemstone? With a rich history and fascinating myths, the onyx is one of the most interesting stones used for gemstone jewelry. Ancient Egyptians, as well as Romans and Greeks, loved this vibrant gemstone and created stories about it. One of these stories states that the onyx appeared when Cupid cut the nails of the goddess Venus. They felt into the Indus River and transformed into the mysterious and brilliant stone that we know today. Coming back to modern days, the onyx is an important gemstone for couples. A black onyx ring is traditional for celebrating 10 years of marriage. Leaving the significance apart, a ring with an onyx gemstone is a cool fashion statement and it looks great with other semi precious stones jewelry. It forms when silica builds up in gas cavities in lava. Onyx comes in a variety of vibrant colors such as red, orange, brown or black. The black onyx is the rarest onyx gemstone. People usually mine onyx from Brazil, Uruguay, India, Peru, Afghanistan, and Madagascar. However, you can also find onyx in the U.S. Whether you get a silver, gold or gold plated onyx ring, it will still look gorgeous. The black onyx variety will work with most of your outfits and be appropriate for any occasion. You can wear it as a statement ring because black onyx in itself represents a statement. It adds a contemporary and mysterious note to your outfit and grabs attention. It is suitable for everyday wear. You can clean an onyx ring easily and because the stone is durable, you can wear it every single day. An onyx ring looks great with almost any other gemstone jewelry piece. Only a few gemstones are as versatile as the black onyx. You can wear your onyx ring with diamond studs, a sapphire necklace or even a turquoise bracelet. The onyx is one of the birthstones of July according to the old birthstone tradition and it is the gemstone of the Leo zodiacal sign. If you know somebody born in July or who is a Leo, an onyx ring may be the perfect gift for them. Last, but not least, this is an accessory both men and women can wear. It has the perfect balance between feminine and masculine and it looks gorgeous on any finger you choose to wear it. Caring for an onyx ring is not difficult. You should avoid mechanical cleaning methods such as ultrasonics or steaming. Instead, you can clean it at home using a lint-free cloth dipped in water. Some onyx stones are porous, so it’s best that you don’t use soap or any other detergent. With a porous onyx stone, the soap can get inside it and cause discoloration. While an onyx ring is a durable piece of jewelry, make sure that you don’t expose it to mechanical shocks. Don’t wear your gemstone jewelry when doing housework or exercising and you should be fine. If you own a silver onyx ring, make sure to polish it every two months to remove the tarnish. On the other hand, if you have a gold plated onyx ring, don’t use the polishing cloth because you can remove the gold layer. If you are looking for the perfect onyx ring, look no further than Ana Luisa jewelry boutique. Dipped in 14k gold and featuring a black onyx gemstone in a bezel setting, this ring is both elegant and creative. It will look gorgeous with a strapless black dress or a sharp suit. Click this link to view Miruna black onyx gemstone ring and to get a high-quality designer piece of jewelry at a fair price.